"This is an easy and somewhat unusual sidedish of steamed cauliflower and kale with a piquant dressing. You can use ordinary kale, arugula or any other cooking green if dino kale is not available -- be sure to adjust cooking time accordingly." In a medium bowl, whisk together mustard, lemon zest and lemon juice. Slowly drizzle in olive oil, whisking constantly. Mix in currants. Set aside. Boil water in a medium saucepan fitted with a steamer rack. Steam cauliflower 4 minutes, until just tender. Drain cauliflower and transfer to bowl with the dressing. Remove steamer rack from saucepan. Place kale in the boiling water and cook 2 to 3 minutes, until just tender. Drain kale and transfer to bowl. 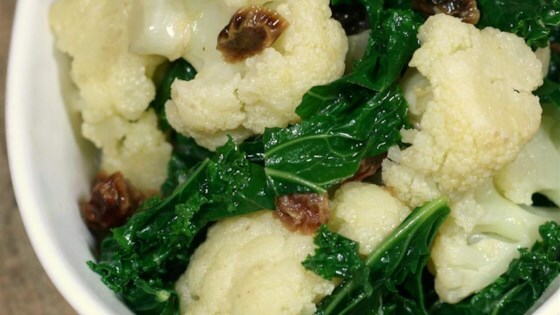 Toss cauliflower and kale with the dressing to coat. Season with salt and pepper. Not good. I was skeptical of the lemon-dijon combination before making this dish; after trying it I realized my skepticism was warranted. It's not a good combo at all. I won't make this again. I followed a reviewer's note on doubling the sauce. the result: delicious!!!! love it, and will definitely make it again.